HP 81, (C4934A) Light Cyan Original Ink Cartridge - HP 81 dye ink cartridges achieve superb, color-rich images on a wide variety of large format media. Patented, dye-based inks are designed together with HP DesignJet printers to ensure uncompromising print quality, performance and reliability. Designed for use with HP DesignJet 5000, 5000PS, 5500, 5500PS. 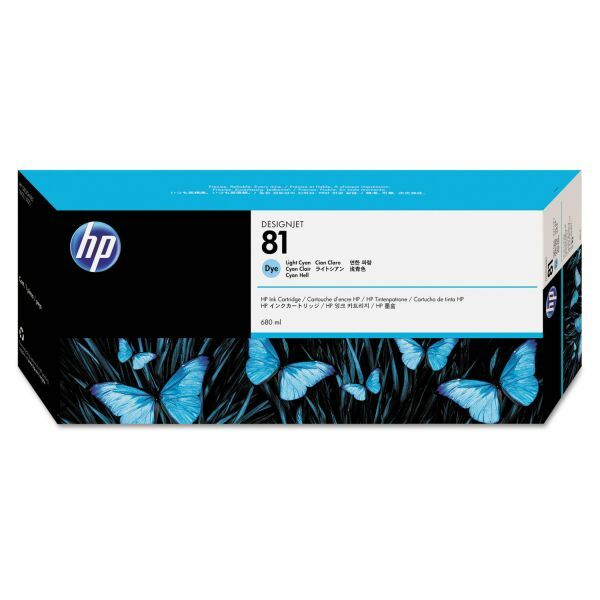 HP 81 dye ink cartridge technology achieves smooth color transitions. Ink formulations support instant dry time to increase productivity and facilitate immediate lamination. A modular ink delivery system enables individual replacement of 680 ml. ink cartridges. Smart printing system technology provides alerts when ink is low and facilitates on-line ordering. Simple installation and reliable operation further enhance productivity and cost-effectiveness. One set of 6 ink cartridges can print up to 1000 D/A1 sized color graphic prints on coated media in productivity mode.